Maradhi Manni: I Am A Changed Person Now... More Self-confidence...Jai Maataa Di! I Am A Changed Person Now... More Self-confidence...Jai Maataa Di! My sister in law had visited this temple long back, around 20 years back! She had said that the road to the temple was too tough and they had to go via a small cave to reach the garbha gruha of Ma Vaishno Devi. I love adventure and wanted to visit this place for a long time. And I love to visit ancient temples than modern temples! Then I came to know how Amitabh, after losing all the money via ABCL, his company (He nearly lost his house too), got the opportunity to anchor Kaun Banega Crorepathi, a quiz show in TV and then no looking back for him. He has got 4 houses in Mumbai now and other assets. He, along with his producers had visited Vaishno devi temple before starting the shooting, for KBC, it seems. I wonder whether it was luck, god's gift or his talent brought him this far! I have heard others also talk a lot about this temple. For us, South Indians, human-like black images are gods. I was curious to see how this temple is and became so famous without a proper moorthi (sculpture) of the devi! I read these links before visiting this temple... Ma Vaishno Devi here. One more link is here. This is the second 'most visited temple' in India, after Sri Venkateshwara temple at Tirupati. This god is believed to be very powerful. 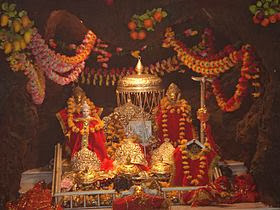 Ma Vaishno Devi did penance in the cave at Trikuta hill, where she resides now, the story says. She is called as Santoshi ma and Lakshmi also...different versions of stories are there. Anyway, this is a powerful god and I could feel the vibration at the temple. Now, let me write about our visit in detail. As I told in my earlier post about 'Wagah border' we went on a North India tour with 20 other couples...Nirmala Tours & Travels, made our tour comfortable. This tour was called, Amritsar-Vaishno Devi tour. 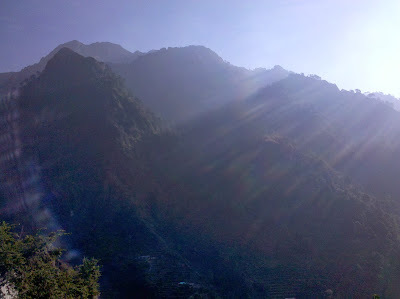 This image of Ma Vaishno devi is from wikipedia. 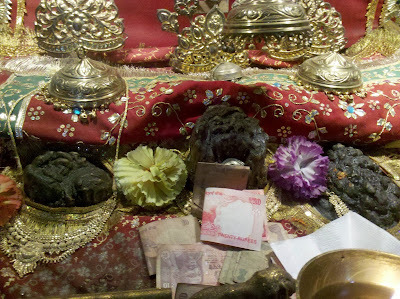 The priest said that the stone in the centre is Ma Vaishno devi. The right one is Maha kaali and the left one is Saraswathi. This is a replica of Ma Vaishno devi which was at the hotel we stayed. We had reached Katra, a small village in Jammu from Amritsar at about 4.30 pm on 22nd Oct. '13 by bus. We stayed at the hotel Shankar Palace. It was good. We had dinner. The Nirmala Travels people bring their cooks along with them. They cooked vegetarian food at the hotels, wherever we stayed and served us. Then, Pradeep, our tour Manager, took us to a place where we had to register our names for visiting the temple. They took our photos and asked where we came from and gave us a card to visit the temple. Pradeep said that it was better to walk to the temple, all 13 Km. at night since the weather would be good instead of walking in the sun in the morning. The shrine is at an altitude of 5300 feet. So, we and some 4 others started walking at 9.30 pm, on that night itself...we had some chocolates and water, that is all and my mobile, which was not allowed inside the temple later! Some people hired helicopters and some horses. We can go by palki too... 5-6 people will carry us...mostly old people use this. I saw many old people walking slowly, shouting 'jai mata di' on my way...the road was quite crowded. Children and youngsters were enjoying the walk. The other people who started walking with us had gone up, walking speedily than us! There were many hairpin bends which were tough to climb because of the road level. Many people took walking sticks with them which cost Rs. 10. Some old people asked us to drink water, just take one sip at a time. We were sitting at benches which were in front of the shops, often. 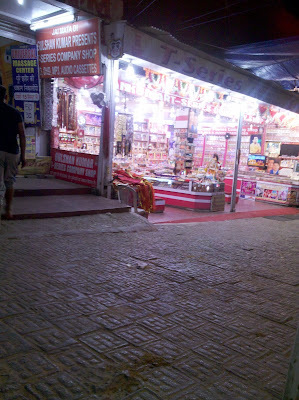 There were many shops selling eatables and drinks. Benches like this were seen everywhere on the way. We sat in these benches often and then proceeded. 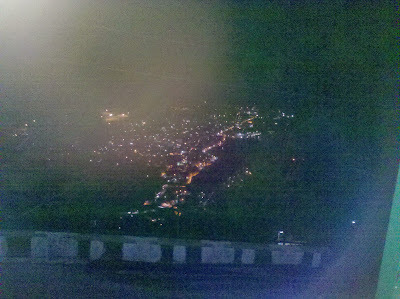 View from the road to Vaishno devi. I noticed around 4 T-series shop (Gulshan Kumar's!) on the way up! 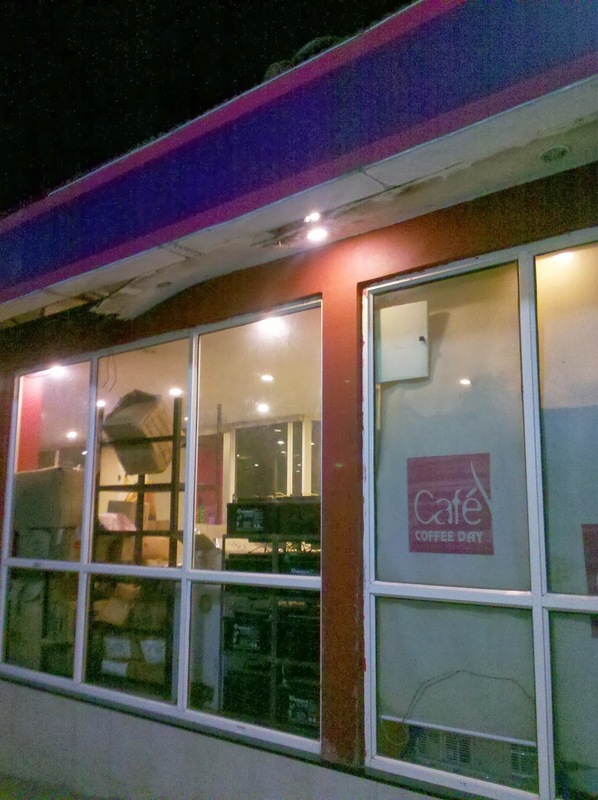 Even 'Coffee day' shop was there! 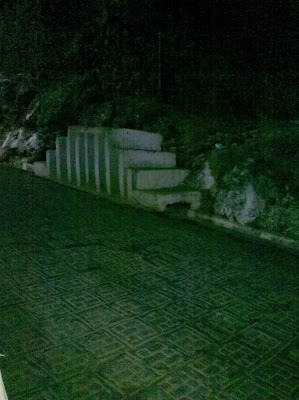 We saw these types of steps on the roadside. They are used for people to hop on the horses. Many people used horses to visit the temple. Our tour manager said that it was tough for women. They had thigh pains the next day! 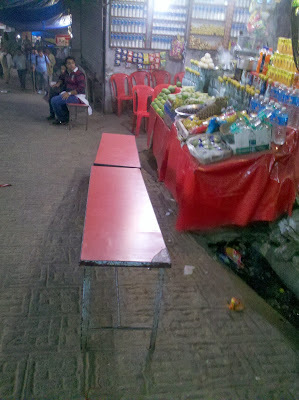 Fog filled road...a small girl is made to sit here with red cloth draped on her, for begging...she was with full make-up! Felt sorry for the girl. The road was so lonely. 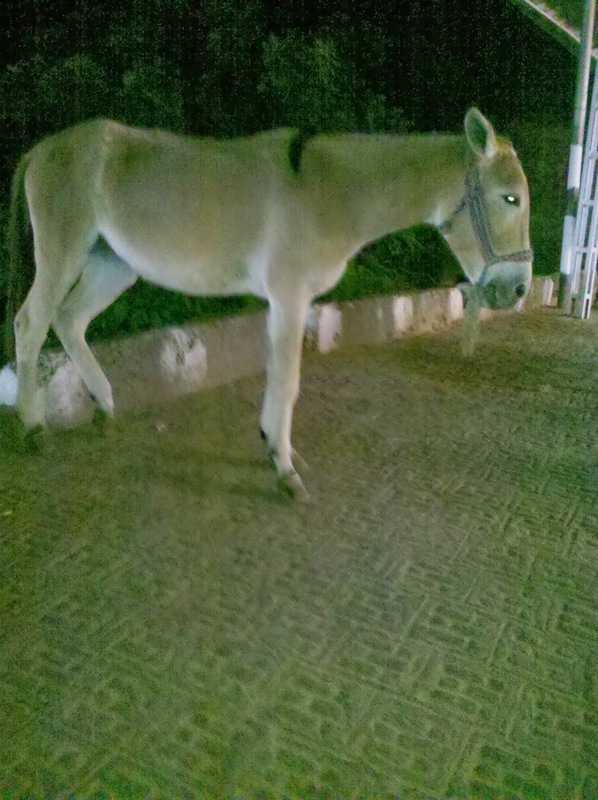 This young donkey looks beautiful...! Since no motorised vehicle could not go uphill, donkeys are used for taking loads, even gas cylinders. 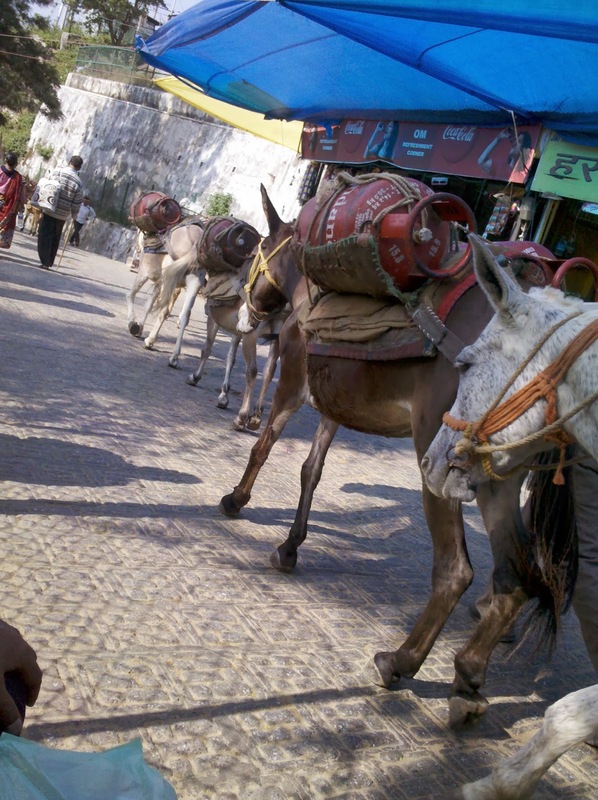 The traffic of horses and donkeys were so much that it was difficult to walk alongside them at places. This picture was taken while coming back in the next morning! One more girl is begging. At least this area is lit and people were there. Some of the friends I met on the way! Saw many langoors too, but was too tired to click them! Our tour manager had insisted on us to take the last 5 Km, the battery car road, which would be easier to climb. We could feel the difference between the road we had come and this road. This was smoother and the steepness was less! People who wanted to climb steps to reach the temple, can do so. But it was too difficult for us! We reached the temple gate at about 4 am, the next morning. 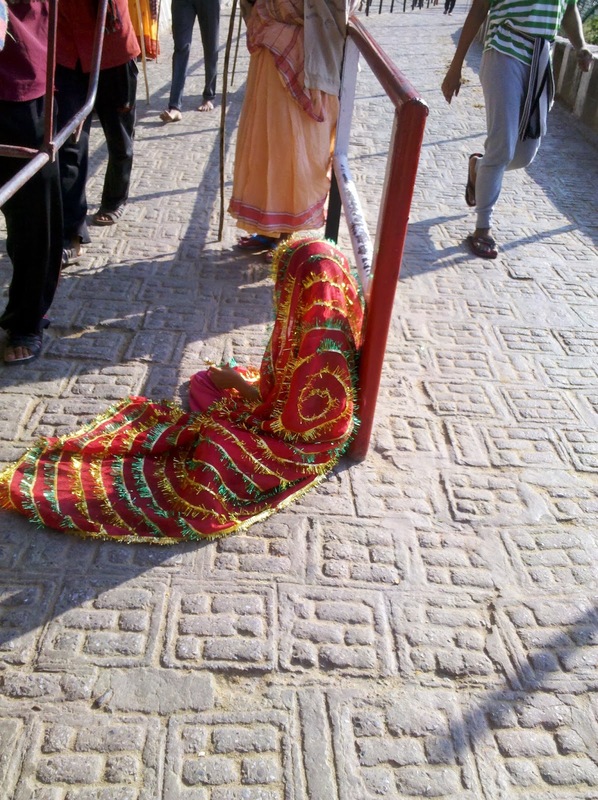 We had to walk more to have the darshan of the Devi...wet steps were there to climb. Every devotee is checked for the registered card. Body search were there at two places. And it was raining outside! 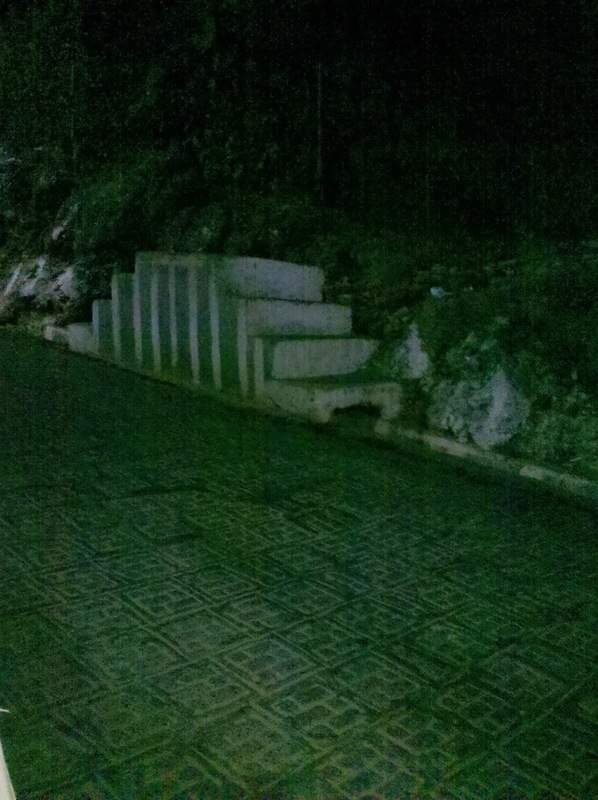 I saw two people skidding and falling down in the steps. Everyone must have been tired. WE were very tired. Thank god, the crowd was less on that day. Red chaddar and nariyal (red zari cloth and coconut) were being sold for offering to the god. The place was too crowded and we were tired to stand in the queue again. So, we just offered some money, which was the only thing with me then! Even hand bags were not allowed inside! Leather is banned, I was told. My husband wore a watch with leather strap. He left it at the hotel itself. I think it is OK. A priest was standing a few steps before reaching the Devi and placing teeka on our foreheads. 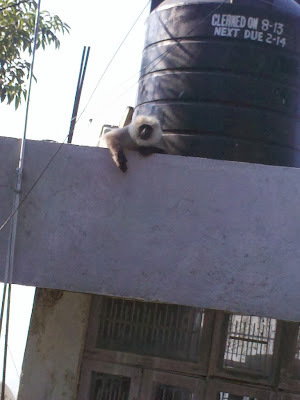 When I reached the Gabha gruha (sanctum), I asked the Panda to explain about the gods since I was coming from Chennai and did not know much about this god. He explained about the 3 gods (pind or pindi). The gods were not facing us but they were on the left side, facing the opposite wall. The old cave has been converted into a modern cave...I didn't feel it like a cave. So, it is very easy to reach the god/deities now. But it was wet everywhere. Then we came out. Again, it was a long way to reach the gate. Since the darshan was over, we felt more tired while coming out. We lost the way and entered the area where horses were standing...so many horses and their stench! My husband had tea and biscuits on the way but since I was feeling a bit sick, I didn't have anything except a little water and it was showing! Somehow we came out of the place and reached a hotel which was very nearby. 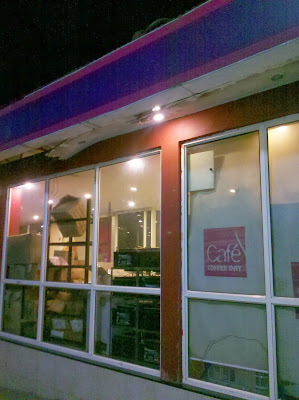 It was 5 am by then. I saw many people sleeping, on the way back, covering themselves with rugs/woollen blankets. We came to know that the temple offers them freely. The verandahs where they were allowed to sleep, were quite clean. Somebody told me that the darshan was closed for the morning aarthi. I thought I would go back and watch it. But then they said that only select people were allowed inside, for the aarthi! Both of us had tea and bread toast at the hotel. It was very cold and drizzling outside. I was shivering though I was wearing sweater. Then, the toilets...they were horrible! The bucket and mugs were also dirty. Why is it like this when our temples get so much money, can't they provide the basic facilities? The toilets on our way up were very clean and modern! We were told that a few battery cars were there to take us down for about 5 Kms. But they started at 8 am. We were so tired to start walking down immediately. They charge Rs.200/- per head, for the 5 Kms. Still, it made us the climbing down easier! No, climbing down was tougher than climbing up! We had to balance ourselves downward! Knees had started buckling often! My husband had some ginger tea and I had ginger soda in a small shop. The shopkeeper had not heard of Chennai or Tamilnadu! But then I thought that I didn't know exactly where Chattisgarh or Uttarakhand was! We were able to get bottled, Kinley water everywhere on our way to the temple, for Rs.20/-. It was a blessing! All goods to the shops came via donkeys. I didn't see any cart or tempo carrying goods on our way! Everybody was smiling and no untoward incidents were seen on the way. I felt sick in the morning hours because of sleeplessness, I think and my husband was sweating a lot in the chilly weather. I was a bit worried about him, but everything went on well, thank god..mata di! We never thought we could make the trip by walk, but we did. I never knew that it would be so tough before going, but then we made it! We reached the hotel at 11.15 am, the next morning! Pradeep, our tour manger said that he was worried about our walking because of our age and he was so happy to see us back, smiling! We had bought some fruits on our way back. Had a hot water bath at our room. Had the fruits and some hot milk and slept till 4.30 in the evening! The next morning, we started to Jammu by bus! Everybody in the bus congratulated us for our trip to the temple by walk. Only a few people in our group did it, it seems! Others went by helicopter and horse backs. Ma Vaishno Devi assured us that both of us have got very good health and make more trips in the future like this! EDITED TO ADD ON 30.11.13: I forgot to mention about a clinic on our road up the hill. There was always a doctor - 24 hours a day, it seems! Nice! Thanks for the nice travelogue and the beautiful photos. JAI MATA DI. SG: Thank you, SG! The comment was quite fast! I am so glad you could make it. It gives a lot of satisfaction that you made it. Very Nice article with excellent pictures. RAMA ANANTH: Yes. I am not able to believe that we could walk uphill like that and come back safely. VAI GOPALAKRISHNAN: Thank you, Gopu Sir! Really beautiful write-up of your Vaishno Devi Teerthayatra. Was wondering if I would be 'called' by Vaishno Mata! The photos are very nice too. As I got 'darshanam' through your eyes and pen let me thank you from my heart. Considering that I may not be able to walk this stretch at this age, your achievement is excellent :) I appreciate the fact that you chose to go by walk - very brave of you! At times, we should get tired like this, it's good for health. Sorry I am late in commenting.The writeup is detailed and gave us a feel of the journey.But I would have preferred both of you taking a conveyance instead of walking long distance in a place with steep gradient.Thanks to Goddess and your faith everything ended well.May your strenuous visit bring all Her blessings to you both. R.RAMESH: Good to know that you are busy with a 'happy family event'! Our best wishes! VC MOULI: Welcome to my blog, Mouli! I had been planning to visit this temple for years now and at last we could visit. Thank you, Mouli for the nice comment. Now, I know that it is better to go with groups to these temples. They guide us well which is very important when we visit places outside our state, esp. The youngsters in the group kept on asking us if our legs were aching, the next day. But we were OK. People who went by horse back had thigh and back ache for a couple of days. Try this trip, just to walk uphill...it is interesting to know that we can do it! TOBY IN INDIA: Thank you, Toby! PRIYA ANANDAKUMAR: We feel very happy even now, Priya, thinking that we visited this temple...I had been pestering him for the past many years. Group tour was our first one and we liked it a lot. We thought the hotels won't go clean and good. But we had A/C rooms everywhere and they were very good...around Rs.1200 per night etc. My husband says that this was cheap considering we visited so many places and stayed in good hotels too. We never travelled at night from Delhi, which helped us to be active in daytime. K.PARTHASARATHY: We walked without knowing how the roads would be! I don't think we would try it again! It took us a long time...after 2-3 hours when we asked the people about the distance we had walked, they would say that it was only 3-4 Kms! When we lifted our head up, the lights of the temple were still like they were touching the sky. Again, we would sit as soon as we saw a bench...! It is fun when we think back! This trip looked strenuous for us, but we saw many Bengalis, Gujarathis etc...very old people walking without showing any stress. Belief counts. Whenever we visit Tirupati, we comment that we should not come back here again...so much crowd and we just get a glance of the god after standing in the queue for such a long time! But we go there every year! Thank you Sandhya for your warm welcome.Actually I have been a 'quiet' reader of your blog for quite some time. Your comment about the toilets being 'so horribly dirty' puts me off even as I talk to my better-half about going on teerthams!Your query as to why we are so so so very dirty is of extreme urgency & importance. We keep our homes & person so clean-'madee & aachaaram' but public spaces we dirty & pollute without a pang of conscience. One reason could also be that the money from our temples 'hundis' is 'managed' by the government whereas money from churc & mosque coffers is not touched!And of course our own are very very dishonest. I am attaching a link for us all to see so that there is 'awakening' as to what goes on in our great Punyabhoomi!Maybe we could get our heads together in this matter of 'clean toilets' which is a very important health issue. After all Cleanliness is next to Godliness!!! And so too honesty & integrity in every facet of Life. I hope you will not misunderstand my attaching this link! Chennai is still known as Madras there..
Yes,blessed are those who can make it to VaishnoDevi shrine. I have been there myself ,but,my wife has gone there a number of times and that too walking all the way up and down. VC MOULI: Thank you for being a serious reader of my posts! I had been writing about the 'toilet' problem in many posts. Tirupati temple area has got clean toilets. Rameshwaram and other temples never bother. I noticed Sulabh's toilets in Humayun's tomb and Kutub Minar. Sulabh toilets are very clean. Even if the toilets are there, people do not maintain them properly. Swindling is there in all religions. That will come in another post, Mouli! Thanks for the link! The corollary to having rights is responsibility in executing our duties.Rights & Duties go hand in hand. This starts with enlightened education from childhood at home and in schools. I read recently somewhere that children in Japan are taught and made to clean toilets during their tenure in school. This is how traditions for cleanliness,consideration and dignity for any type of labour is instilled in childhood that will last throughout life. If in Bharat any school even dares to suggest such an idea majority of parents including many of us will be up in arms.At home the scenario in well-to-do families( even in middle-class families) is to let our children grow up in the 'protected' style of comfort and unconcern for such important issues. Believe me at times toilets (and kitchens) in some homes of people sharing our own background come nowhere near to ''passing the clean test"! Perhaps that was why people belonging to the generation of our grandparents never ever ate or drank anything outside their own homes to avoid such situations. My paternal grandmother visiting us had a train journey of over 20 hours and it was a 'Niraahaaram & Nirjalam Prayaanam' for her! Our Indian psyche has reached a very sad state of mind.Public toilets are rightfully used (mostly used irresponsibly and dirtied) BUT the duty of cleaning must be handled by government agencies. Water taps are left open dripping,water splashed and wasted,spitting 'chewed betel leaves' staining unimaginable nooks and areas with no concern for anyone!At times it makes one believe that such 'perpetrators' get vicarious pleasure in acting 'psychopathically'! Everything and anything public is not 'our business'.They are all there very much and only for our use.There is no thought for the responsibility from our side for respecting,maintaining and passing on these value systems to our youngsters. Yet these are the very people stepping onto Western soil who will bend over backwards ( at times even break their vertebral column) to follow rules! When we see the LIGHT??? Sorry from Mata Vaishno Devi I have led you down onto this topic!! !But then everything under the Sun is related. We have to 'teach them young'. Right education with (vivekam) & awakening of our 'Gnaanachakshus' is the KEY to very many problems our country is facing today which we have sadly lost somewhere in this mad race chasing shadows! Let us hope things change for the better! Loved the post with the pictures Sandhya. I want to visit it sometime too. I agree with DI. Even I couldn't have made it on foot for sure. Loved this post! Great that you made the journey so well. Jai Mata Di! 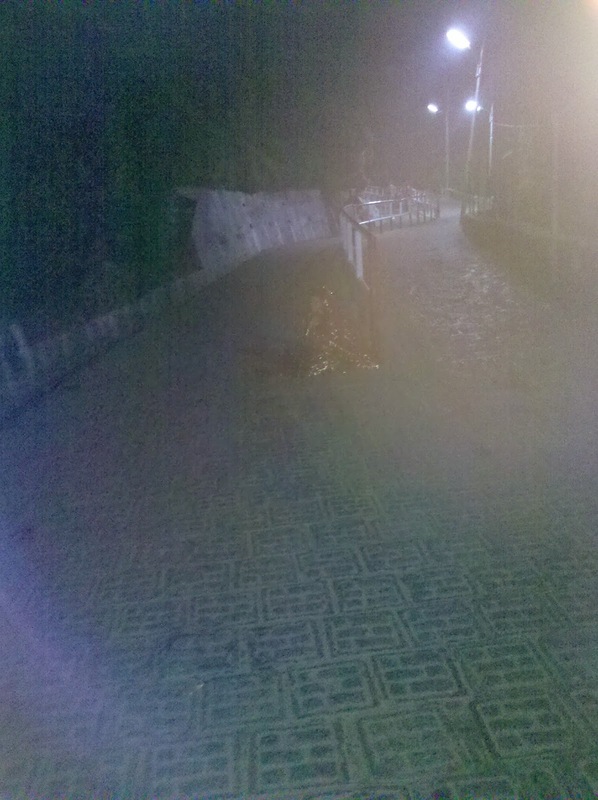 GAURI GUHA: Some road repair work was going on, on the passage to the Bhairav temple, we were told. So nobody in our group went there this time. You went there 5 times? Great!It was tough for us, may be because it was the first time! Thank you, Gauri! VC MOULI: In our days, when we were children, we were asked to do all housework. But now, since we have got only one or two children, we never expose them to any 'hardships'! So, they grow up in cofort! They find it very difficult when they go to hostels or abroad, where they have to take care of washing clothes, keeping the room clean etc. Hmmm...even my children did not know to wash clothes before starting to stay alone. After coming back, they are back to living a smooth life! And we have got servants for everything, here! I had made them to clean toilets a few times when they were in school. I couldn't make them do it after they entered bigger classes! But they do this when they live abroad! I remember my grand mother taking poha/aval with her when she went on tour. She was buying curd and eating poha. But they survived! This is going to continue. Punishment is the only way to keep our places clean! AVADA KEDAVARA: Go when you are still young and with good company. You will enjoy the nature, Ash! SAI CHARAN: I have heard about the movie on Mata Di and seen the movie 'Avataar'! Nice write up Sandhya. I like to go to see such places...My mom has been to varanasi and other places in north india,she wish to go here too. Going through your comments i realized sai has put the link of the song i wrote in my previous comment. VARUNAVI: My family members have visited Varanasi...most of them! 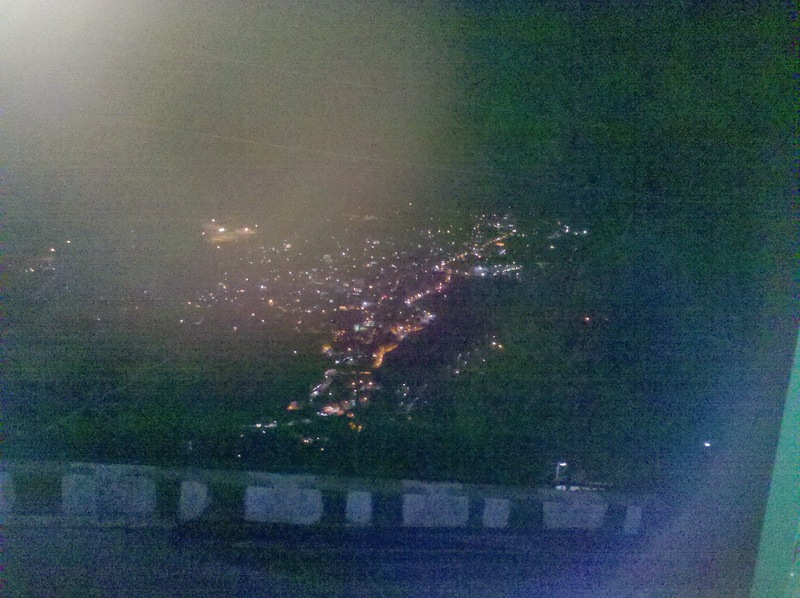 But Vaishno Devi is new...just a couple of my relatives have visited this place. Yes, I have seen this movie! Thank you, Saritha! RAMAKRISHNAN RAMANATHAN: Thank you, Ramakrishnan! I know you will walk to the temple! Please do visit! Your write up was very interesting to read, this is one another place that I want to visit. Many of my friends too have, I really appreciate the fact that you both somehow made to her shrine. RAMA ANANTH: It was very tough but we made it! Husband wants to go there again, but this time, by helicopter! WISHING ALL, A HAPPY AND PEACEFUL DEEPAWALI!